So... I couldn't restrain myself. At all. Big surprise there. I ended up staying up until midnight, ignoring the cramping in my hand, just so that I could finish last night's cake decorating project. And I am DYING to make cupcakes right now, just so I can try some other techniques that I googled last night. I blame it on this website here, which gave me an overdose of inspiration!! But, we still have lots of the really dense version of the chocolate sour cream bundt cake (the baking soda-less one) left over from my parents' visit. And my freezer just can't handle any more food right now. You basically use a tip 1 or smaller (0 or 0.5 work well too). Once you've outlined the mark left by the cookie cutter, you then zigzag the icing back and forth, really close together until you've filled the entire surface. Clearly, mine does not look professional. 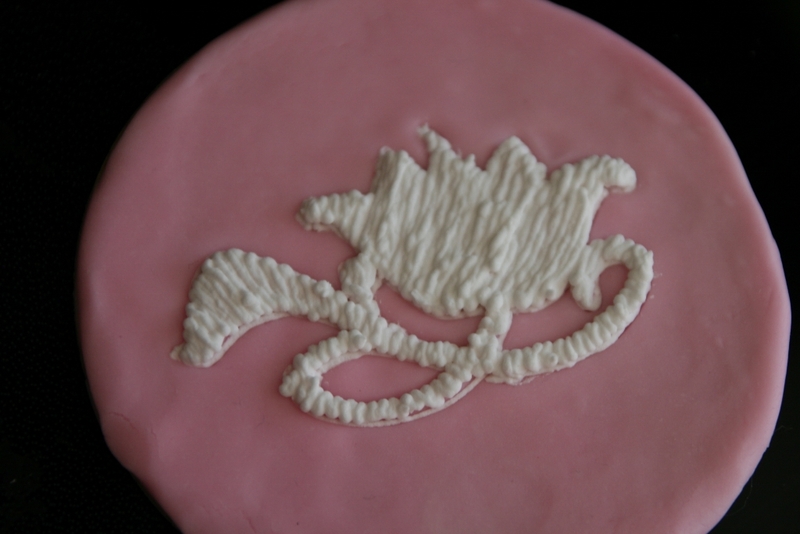 Gotta work a bit on getting the icing right to the edges so you can't see the outline. But you've gotta start somewhere. I can't see myself using this to decorate a whole cake, as I think it'd kill my hand (the notes we got said you have to rest a lot between stitches). But I guess it's always nice to have different techniques you can play with. Or maybe once my hand muscles get into better shape from all this cake decorating I could whip this out in an instant??? ?